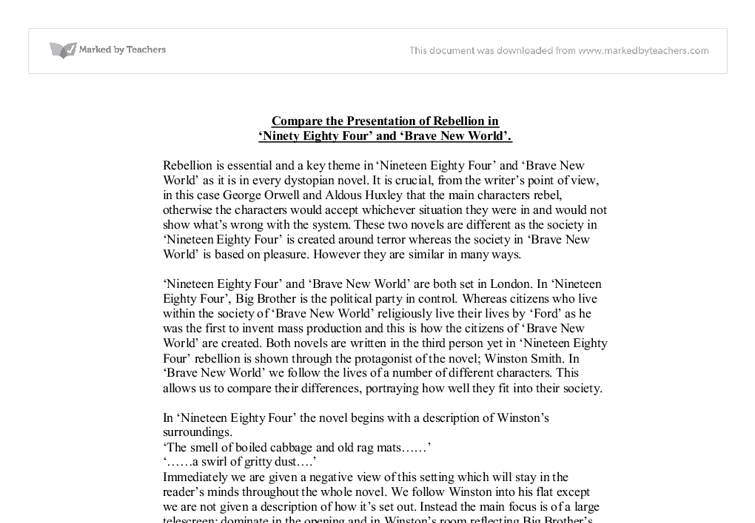 Compare the Presentation of Rebellion in 'Ninety Eighty Four' and 'Brave New World'. Rebellion is essential and a key theme in 'Nineteen Eighty Four' and 'Brave New World' as it is in every dystopian novel. It is crucial, from the writer's point of view, in this case George Orwell and Aldous Huxley that the main characters rebel, otherwise the characters would accept whichever situation they were in and would not show what's wrong with the system. These two novels are different as the society in 'Nineteen Eighty Four' is created around terror whereas the society in 'Brave New World' is based on pleasure. However they are similar in many ways. 'Nineteen Eighty Four' and 'Brave New World' are both set in London. In 'Nineteen Eighty Four', Big Brother is the political party in control. Whereas citizens who live within the society of 'Brave New World' religiously live their lives by 'Ford' as he was the first to invent mass production and this is how the citizens of 'Brave New World' are created. 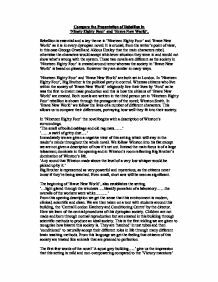 Both novels are written in the third person yet in 'Nineteen Eighty Four' rebellion is shown through the protagonist of the novel; Winston Smith. In 'Brave New World' we follow the lives of a number of different characters. This allows us to compare their differences, portraying how well they fit into their society. ...read more. Another act of rebellion Winston commits is dreaming. Although this cannot be helped it still goes against Big Brother. Winston dreams of his family 'Winston is dreaming of his mother......' The unpleasant present allows flashbacks of better times and shows us how different Winston's world is now. However his past is becoming vague as the party destroy it. Ironically, Winston is greatly involved in destroying the past. He works in the 'Ministry of Truth' and his job involves translating documents from the past from 'oldspeak' to 'newspeak'. The language we use today is known as 'oldspeak' and by the year two thousand and fifty should be completely changed to 'newspeak' (which is a cut down version of 'oldspeak'). This makes readers think about the future as according to the novel, our present day is outdated and we have all these changes to come. Although Winston finds his job 'satisfying' he does not agree with the way our language is being destroyed and as readers we side with him as it's the language which we are accustomed to. To emphasise our opinions in the favour of Winston's, Orwell creates the character Syme who is in favour of 'newspeak'. 'It's a beautiful thing, the destruction of words..........' Syme shows us how important it is to rebel to avoid becoming too religious towards the system. ...read more. 'We believe there is some kind of conspiracy, some kind of secret organisation working against the party.' Now Winston has received the book he is at a peak of hope and success and after reading it is informed of the workings of the system, although he feels he has not learnt anything new. Soon after this Winston and Julia are captured and separated. Winston is interrogated by O'Brien, who we find out is in fact a member of the inner party and 'The Brotherhood' and 'The Book' do not exist. Ours and Winston's hopes are shattered as now we know there is no hope for anyone and that Big Brother will remain forever. After By force, Winston learns to love Big Brother which goes against everything he believed in. Orwell has created Big Brother to be feared as evidently no one can rebel against it without getting caught and nothing will ever be overthrown. The more dangerously increasing acts of rebellion allow Orwell to build up tension to create a point of climax - the dread room 101. It is here where Winston admits past acts of rebellion and betrays Julia. 'Nineteen Eighty Four is a powerful novel as its system could easily be adapted to our everyday lives. Its overall theme of terror makes it a fearful and powerful read. 'He had won victory over himself. He had loved big brother.' ...read more. Winston Smith fought to preserve his identity, an identity thwarted by O'Brian like an individual in a world where "there will be no emotions except fear, rage, triumph and self-abasement", totalitarianism. "Alone-free-the human being is always defeated. It must be so, because every human being is doomed to die, which is the greatest of all failures. This is only an ironic preparation for his final defeat. His physical inadequacy is always in evidence. Another example of Winston as an anti-hero is during the two minute hate, "within thirty seconds, any pretence was always unnecessary." This shows The Party's ability to manipulate the worst in human nature, so with this power, the Party is surely undefeatable. Despite the fact that Winston has been having a relationship with a woman called Julia, he still feels the need to look toward O'Brien for approval of his ideas. When O'Brien invites him to his house, Winston begins to believe that in fact, O'Brien is a conspirator against the Party. Each part contains a different focus then the other. Part one is based around a pessimistic tone of the poverty stricken city. The theme of totalitarianism is introduced as Orwell describes the bleak solitary regime of Big Brother. Orwell goes into great detail of the party and the Ministry of Truth where Winston's occupation is based. Atwood's dystopia seems to be less claustrophobic, one of the main differences have to be the predicament both characters (Winston & Offred) are suffering from. Huxley describes this to us, sarcastically, as a "bright treasure of sleep-taught wisdom". Here we can see that people have been fooled into seeing the artificial high given to them by soma as true happiness. Therefore, they have become emotionally blank, with the only escape from anything out of the ordinary being a trip of false happiness. the end of the novel, she is not alone in her fascination with the Savage but the appearance her intrigue takes on is somewhat different from the others, again showing the difference in her from the rest of society. Lenina's affair with the Arch-Community Songster is a symbol of her reluctance in promiscuity.